I have received a lot medical attention over the past seven days. I had two medical procedures at the end of last week, on the side and the back of my head. I needed local anaesthetics, and spent the rest of the day at home. I was worried that my sarcoidosis was threatening to spread from my lungs. I thought I was over it all by Sunday morning when I was preaching in Christ Church, Delgany. I went on to Co Wexford that afternoon and then went to work on Monday. But I never expected the post-op setbacks I experienced later in the week. I had worked hard at meetings with visitors from the Scottish Episcopal Church on Monday, but by Tuesday I realised I had pushed myself too far and went home late in the morning. I eventually went back to work late yesterday afternoon [Thursday], but still needed to visit my GP in the early evening for my regular injections for my B12 deficiency. As I was waiting in the doctor’s waiting room, I mused about how vets have decided that are now going to call themselves “Dr” as they have the cure of animals. Last month, the Royal College of Veterinary Surgeons made a ruling that vets may call themselves ‘Dr.’ The medical consultant surgeons I know prefer to us the title “mister” or its equivalent, even when they have earned a PhD or MD degree. But in their hearts, many of vets felt they had been hard done by. They pointed out that they had studied and worked just as hard and for just as long as their medical colleagues. The Royal College of Veterinary Surgeons says the use of the title ‘Dr’ is optional, and has produced guidelines to support the change. It stresses that veterinary surgeons using the title should be careful not to mislead the public, and that it is important that the use of ‘Doctor’ or ‘Dr’ by a veterinary surgeon does not suggest or imply that they hold a human medical qualification or a PhD. So much for the cure of animals. But what about the cure of souls? As priests, are we soon going to start calling ourselves ‘Dr,’ irrespective of earned degrees, because we have the cure of souls? In the past, the cure of souls was seen to be part and parcel of the priest’s vocation, although modern psychiatry has claimed this ground in recent times. But the priest remains responsible for the cure of souls, in the sense that all souls and hears are in need of healing, even though the cure of souls is never complete in this life. The cure of souls (cura animarum) is often rendered today as the “care of souls.” That cure was not only over a congregation or congregations, but over a district. The term parish as applied to this district comes from the Greek word for district, παρоικία, and the concept still survives in the word curate. The cure of souls or cura animarum is exercises in instruction, sermons and admonitions, with sanctification, and through administering the sacraments. Those with the cure of souls include bishops in their dioceses and priests in their parishes. According to the Spanish Jewish philosopher Maimonides (1135-1204), who was a also medical doctor, if you fix your ill soul, you fix your whole self. Thou has blest thine earth, thy rivers and thy mountains with healing substances; they enable thy creatures to alleviate their sufferings and to heal their illnesses. Thou hast endowed man with the wisdom to relieve the suffering of his brother, to recognise his disorders, to extract the healing substances, to discover their powers and to prepare and to apply them to suit every ill. In thine eternal providence, thou hast chosen me to watch over the life and health of thy creatures. I am now about to apply myself to the duties of my profession. Support me, Almighty God, in these great labours that they may benefit mankind, for without thy help not even the least thing will succeed. Inspire me with love for my art and for thy creatures. Do not allow thirst for profit, ambition for renown and admiration, to interfere with my profession, for these are the enemies of truth and of love for mankind and they can lead astray in the great task of attending to the welfare of thy creatures. Preserve the strength of my body and of my soul that they ever be ready to cheerfully help and support rich and poor, good and bad, enemy as well as friend. In the sufferer let me see only the human being. Illumine my mind that it recognise what presents itself and that it may comprehend what is absent or hidden. Let it not fail to see what is visible, but do not permit it to arrogate to itself the power to see what cannot be seen, for delicate and indefinite are the bounds of the great art of caring for the lives and health of thy creatures. Let me never be absent-minded. May no strange thoughts divert my attention at the bedside of the sick, or disturb my mind in its silent labours, for great and sacred are the thoughtful deliberations required to preserve the lives and health of thy creatures. Grant that my patients have confidence in me and my art and follow my directions and my counsel. Remove from their midst all charlatans and the whole host of factious relatives and know-all nurses, cruel people who arrogantly frustrate the wisest purposes of our art and often lead thy creatures to their death. Should those who are wiser than I wish to improve and instruct me, let my soul gratefully follow their guidance; for vast is the extent of our art. Should conceited fools, however, censure me, then let love for my profession steel me against them, so that I remain steadfast without regard for age, for reputation, or for honour, because surrender would bring to thy creatures sickness and death. Let me be contented in everything except in the great science of my profession. Never allow the thought to arise in me that I have attained to sufficient knowledge, but vouchsafe to me the strength, the leisure and the ambition ever to extend my knowledge. For art is great, but the mind of man is ever expanding. On the other hand, Doctor of the Church is a title given to individuals recognised for their importance, particularly their contribution to theology. In the Western Church, there are four eminent “Fathers of the Church” who are called Doctors of the Church since the Middle Ages: Saint Gregory the Great, Saint Ambrose, Saint Augustine and Saint Jerome. In the Eastern Church, three Doctors are pre-eminent: Saint John Chrysostom, Saint Basil the Great and Saint Gregory Nazianzen. 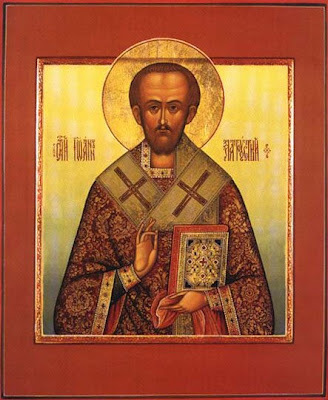 Saint John Chrysostom (347-407) outlined the obligations of priests in his treatise On the Priesthood. It is perhaps the first really great pastoral work ever written, although he was only a deacon when he wrote it. It stresses the dignity of the priesthood. The priest, he says, is greater than kings, angels, or parents, but priests are for that reason most tempted to pride and ambition. Priests, more than anyone else, need clear and unshakable wisdom, patience that disarms pride, and exceptional prudence in the cure with souls.